By the end of March, I will have flown in and out of 5 different cities in a span of 2 months! That's the most back-to-back travel I've ever done in such a short span of time. While traveling is exciting, it can take a toll on your body if you're not careful. Especially if you're flying, you're more prone to catching a virus since you're trapped in a metal tube of canned air that's definitely chilling with germs and bacteria. I'm doing everything I can to stay healthy, so here's what has been working for me SO FAR! 1. Hydrate before, during, and after your flight. I can't say it enough - hydration really is key to staying well. I choose the aisle seat, so I can get up to pee as often as I need. I recommend purchasing a high-quality reusable water bottle to carry with you everywhere. My favorite is the Riley Stainless Steel Water Bottle by Ello Products. I love this bottle over the others I've tried, because it's more hygienic - the top and bottom twist off, so you can clean it easily and never wonder what's growing at the bottom of your bottle. It keeps drinks cold for 24 hours, and it's BPA, phthalates, PVC, lead and cadmium free. Not to mention, it's top rack dishwasher safe. You can get it here at Target. Details on my favorite travel water bottle by Ello here. 2. Keep your nasal passages moist to prevent sickness. People don't talk about this enough. When your eyes, nose, and mouth get dried out, you become much more susceptible to viruses and bacteria. Since the air inside the plane cabin is recycled, germs and contaminants circulate through the air that you'll inevitably breathe in. I recommend getting a natural nasal spray like Xlear Nasal Spray to keep your nose hydrated. This will help you filter and flush out the germs. 3. Amp up your supplement intake. In addition to eating well, I take supplements to help boost my system. Here's what I always take with me on my travels. Echinacea Drops: I put two droppers full in my water and drink it in the morning. If I'm feeling under the weather I do it 2-3 times a day. It can help your immune system at the first sign of a cold, and I personally swear by it. Zinc, Vitamin C, and Vitamin D: I take all of these supplements daily, but I amp up my Vitamin C + D when I'm traveling. My favorite brand is Garden of Life - it's one of the cleanest supplement brands in my opinion. I've been using them for about a year. Organic CBD Oil: This is 100% organic and derived from hemp. It does NOT contain THC which means it's non-psychoactive (you don't get high). CBD oil helps tame my gut inflammation and anxiety when I fly. I haven't had any issues with getting it past security because it is 'CBD only'. Lee from America and The Balanced Blonde both wrote some informative blog posts on CBD, so check them out. Digestive Enzymes: This has become KEY for me and my gut issues. I am allergic to wheat and a slew of other ingredients that are in just about everything. When I'm traveling and in a situation where I might eat food that inflames my gut, I take a digestive enzyme with the first bite and it helps my stomach break down everything better. 4. Come prepared with your own healthy airplane snacks. Turkey Jerky: Trust me, I never thought I'd eat jerky. I had an outdated perception of it and now consider it as a healthy clean protein option when I'm traveling. My favorite jerky is from Epic, because it has the cleanest ingredients with no added sugar. Pumpkin Seeds: Pepitas are one of my favorite snacks, because it's high in zinc, magnesium and iron. These nutrients help build your immune system, boost your mood, and fight colds. The magnesium content alone can help your muscles relax and can give you a more restful nap on the plane! Carrots + Cashew Butter: Some people find this combination weird, but I promise it's really tasty! I love finding ways to sneak in fresh veggies when traveling, and this is my go-to. I throw it in my reusable Stasher bag which is an eco-friendly alternative to zip-lock bags. 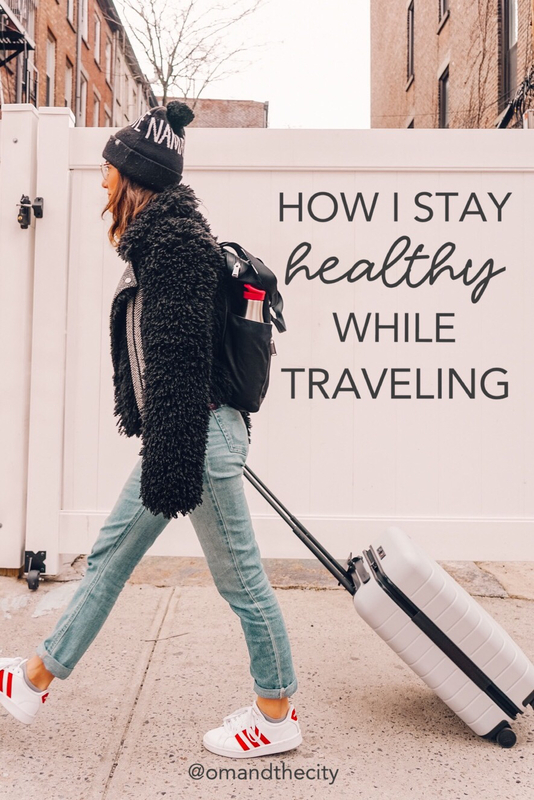 Have any tips for staying healthy while traveling? I'd love to hear 'em! Comment below to share! This post was written in partnership with Ello Products. All thoughts and opinions are always my own. Thank you for supporting me and the brands I love!